24These things may be taken figuratively, for the women represent two covenants. One covenant is from Mount Sinai and bears children who are to be slaves: This is Hagar. 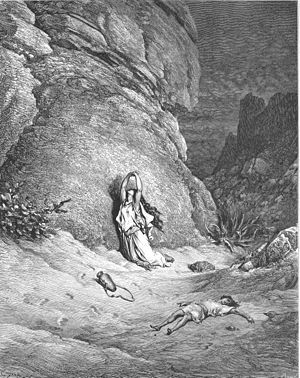 25Now Hagar stands for Mount Sinai in Arabia and corresponds to the present city of Jerusalem, because she is in slavery with her children. 26But the Jerusalem that is above is free, and she is our mother. If you’ve read much of the Old Testament from Exodus on, you might get the impression that God is really interested in Israel. And, you’d be right. He spent a lot of time making a people His own who had no claim on God whatsoever. God called them out of Egypt by Grace. They wandered in the desert and were provided for directly from the hand of the Lord. Yet, God took the time in the midst of this “transitional period” to give them the Ten Commandments. Why? Weren’t they getting along? But before the ink on the stone had dried (figuratively speaking), they were building a golden calf to worship. Israel was a nation of … idolaters. Of course, that is symptomatic of mankind in general. Israel, like Adam, were the best possible representatives of the human race. But they couldn’t remain loyal to Yahweh or Moses long enough for them to “finish business”. As time went by, Israel broke these and many other laws that the Lord gave them. Time after time, they would be taken by other nations into slavery as punishment. Eventually, they added more laws to God’s laws so that they wouldn’t get close enough to break the real thing. It’s like if you told a child, “don’t pick up that vase”. The real problem is you don’t wan them to drop it, but to make sure this doesn’t happen, you anticipate and give them a command that subverts their intent. This was the situation with Israel as Christ entered the picture. The Pharisees asked why the disciples of Jesus broke their rules. Jesus would respond by asking them why they broke the rules of God. And so, Israel was at it again, making a golden calf out of man-made laws. They were worshiping their own obedience, their own morality, their own righteousness. They became living idols to themselves. This Pharisaic form of Judaism crept into the church, as well. Paul, who was a Jew of Jews, absolutely rejects the notion that returning to law will “right” the behavior of the non-Jewish converts to Christianity. He asserts that the judaizers in the church were sons of Hagar and Ishmael rather that Sarah and Isaac. Why? Because they held that their sonship was maintained by their efforts to hold to God’s Law as revealed in the Old Testament. They had forgotten the foundation of the Ten Commandments which read “I am the Lord your God who brought you up out of Egypt. They had forgotten that they were not a people before God chose and rescued them. They had forgotten how He parted the Sea. They had forgotten how the Israelites were fed by bread from heaven and water from a rock. They had forgotten that they stood on the mercy of God. They were children of promise who sold their birthright for the bitter meal of Law-keeping self-idolatry. But, Paul speaks to the gentile converts and says that they (like Israel) were children of promise. They were children of old, old Sarah. They were the last born. They were not the “seed”, but were children of Ishmael who were transplanted into the stump. They were adopted by God Himself in Jesus Christ. They were now sons of the living God. The laws that they lived under were slavery to every form of gross sin under the sun; temple prostitution, orgies, drunkenness, jealousy, envy, etc. They were slaves to their desires. Their gods were their stomachs. But it was for freedom that Christ had set them free. Was He setting them free to observe the Pharisaic morality invading the early church? No, He was setting them free to live in the constant light of God’s mercy, forgiveness and grace distributed through the body and blood of Jesus Christ. He was setting them free from gross sin, so why would he want them to learn the Pharisaic idolatry of the judaizers? That is religious sin. We face this today in the church. Many would like to enslave you with demands, guilt and manipulation. These vipers should not think that they will receive one thing from God. They have become idolators of the worst sort. They have abandoned Christ and all His mercy. They have returned to the vomit of self-righteous living. And they want you to follow along.